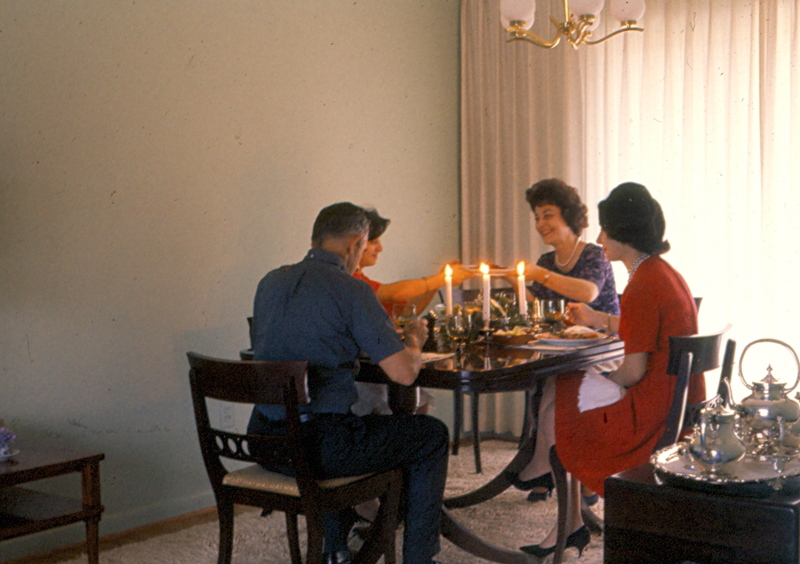 Thanksgiving dinners in my childhood home were small affairs. Only the four of us sat at the table, nibbling on turkey, bread stuffing and pumpkin pie. My father would strategically set up the tripod, attach a shutter release cable to his Kodak Retina, and set the auto timer to ten seconds. After clicking the switch, Dad would race helter skelter to the table while trying not to trip over the tripod, plop himself down in his chair and arrange himself to look as though he had all the time been sitting at the dinner table tucking into his turkey tail. During the several takes it took to get a decent shot, the rest of us were instructed to smile and pass the food, which by this time was probably good and cold. My particular job on Thanksgiving, one from which, for some odd reason I derived a great deal of pleasure, was to open the chilled can of Ocean Spray cranberry sauce. The strategy was to remove the lids from both ends of the can, and push the dark red, solid jelly out without mashing it into a messy glob. I prided myself on coaxing the intact cylinder of sauce, complete with ring marks from the can, onto its serving plate, where it was sliced into perfect circular pieces. Expertly pushing cranberry cylinders from cans abruptly ended the year I married, right after I hosted my first Thanksgiving dinner and endured incessant carping from my newly acquired family about the canned cranberry sauce, perfect circles notwithstanding. The following Thanksgiving I was compelled to learn from my mother-in-law how to make homemade cranberry jelly, which entailed smashing hot boiled cranberries through the holes of a colander with a wooden spoon, blistering my palms and splattering everything within a ten-foot radius of my kitchen sink with bits of sticky red pulp. I enjoyed Thanksgiving as a child and it continues to be one of my favorite days of the year. As I raised my own family, however, Thanksgivings grew to be considerably larger than those of my childhood. Up to 50 people have gathered at my groaning board and we’ve washed down with champagne and cider entire flocks of turkeys, gallons of mashed potatoes smothered with buckets of gravy redolent with sherry, and skillions of pumpkin pies heaped high with fluffy whipped cream. The only sure thing in life is change, and this year Thanksgiving has come full circle as I return to the smaller gathering reminiscent of those of my childhood. It will feel different, but also familiar, and remembering the spirit of the day, I will continue to give thanks for what was, what is, and what will be. Lovely memories. Thanks for this Thanksgiving Gift. Have a Happy Thanksgiving Susie. Sniff..sniff…I miss those champagne flowing Thanksgivings with your chocolate beet cake. I still chuckle when I think about the time I went to John’s preschool class where the teacher had posted everyone’s “what I am thankful for” on the wall. Everyone with the exception of one, was thankful for either family, God, friends, teachers, butterflies and flowers. My sweet little son was thankful for Las Vegas! Thank you for the gift of your memories, and a happy Thanksgiving to you!